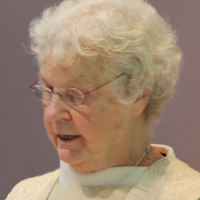 Mary Frances Smith was ordained to the priesthood on August 16, 2009. She obtained her Bachelor of Science in Nursing from the College of St. Teresa in Winona MN in 1973, and her M.A. in Theology from the College of St. Catherine in St. Paul, MN in 2008. Mary is a registered nurse who has worked in psychiatry for 40 years. 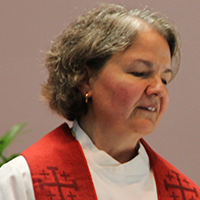 Since becoming part of the womenpriest movement, Mary has supported the movement in a number of roles. In 2008 and 2009, she was a member of the Women’s Ordination Conference Board of Directors, which met in Washington D.C.. She served on the leadership circle for the RCWP Midwest Region. She was a participant on the ad hoc committee that was charged with the task of updating the RCWP Constitution, eventually chairing that group. She has mentored womenpriest candidates who are preparing for diaconal and priestly ordination. Currently, she serves as one of two pastors for Mary Magdalene, First Apostle, by presiding at Masses and giving appealing as well as erudite homilies. I am Marvin Smith and I’m here to recommend that Mary Frances Smith be ordained as a Roman Catholic Woman Priest. After 33 years as Mary’s husband, I consider myself an expert witness on Mary-matters and the bearer of inside information. I, like all who know her, realize there’s something about Mary that just fits with becoming a priest. So what are those qualities that recommend her? Clearly among them, are her compassion and reverence for life and her deep appreciation of people as unique individuals deserving care and consideration. Those qualities make her the outstanding and professional psychiatric nurse she is. Another essential characteristic is a special quality, revered, and perhaps needed during these times more than ever. It’s motivated by a deep sense of justice and guided by honesty, selflessness, and steadfast commitment. It’s a willingness to do hard things. To quietly stand and advance a just cause when told to sit. To conscientiously speak and thoughtfully act in harmony with what one knows is right in the face of disapproval. It is strong character that can forge profound change by exposing and eradicating discrimination and injustice. Mary’s pursuit of ordination has been demanding. From completing a Master’s Degree in Theology to proceeding through the diaconate and priestly discernment all while working full time to help finance her children’s college education—all hard things. Activities like serving on the Women’s Ordination Conference board to accepting facilitative roles on RCWP Committees are among the hardest things for her to do. Speaking before groups and traveling to distant cities may be easy for some, but not for Mary. Just sitting next to her through turbulence makes one convinced sedatives are a miracle drug. Yes, her priestly journey has been hard, but from my expert viewpoint, it has been the most natural, genuine, and personally correct path she has ever walked. Bernadyne “Bernie” Sykora was ordained a Roman Catholic womanpriest on June 23, 2013. After attending Mary Smith’s ordination on August 16, 2009, Bernie initiated the formation of the group that would evolve into Mary Magdalene, First Apostle. She led them in organizing a series of Catholic Masses presided over by Mary, first in an apartment building in Sartell, then at St. John’s Episcopal in St. Cloud. On January 27, 2011, Bernie announced to the group that she could no longer deny her own vocation to the priesthood, confessing a calling she had tried to reject because of her age. Throughout her life she had longed to be at the altar to celebrate the liturgy of the Eucharist. “My parents were very devout people, who lived on a farm in southwestern Minnesota, about four miles from the nearest church, but we didn’t miss a Mass, and we went to a neighboring church if there was no Mass at our church, so it was quite an effort at times,” she said. Bernie attended Good Counsel Academy, a high school in Mankato. After high school she attended one year at the College of St Benedict and then joined Maryknoll. She earned her B.A. degree from Maryknoll Teacher’s College in New York and was assigned to the Panama Canal Zone, where she stayed until leaving the order after five years. While teaching in Redwood Falls, MN, she married Don Sykora. They moved to the St Cloud area where she earned a Master’s Degree from SCSU in the education of children with special needs. She taught Special Education in the St Cloud School District until retirement. Bernie said the children taught her to formulate ideas in clear structure and to express them effectively. They helped her develop a caring heart and empathy for people. All of these lessons assisted in preparing her for the leadership role that seemed to be thrust upon her in the Community of Mary Magdalene, First Apostle. Bernie was married to Don Sykora for 49 years before his death, and together they raised four children. She has seven grandchildren and six great-grandchildren. Her offspring and most of her seven living siblings support her call to the priesthood. To contact Mary Magdalene, First Apostle, email Bernie at bernie@sykora.me. "My pain at having been kicked out of the priesthood has allowed me to glimpse the exclusion and discrimination that people of color, women, and gay people in our Church have experienced for centuries." WOMAN said, This is my body. This is my blood. “Clericalism has expropriated the people’s collective participation in ministry, word, and sacrament. . . . Re-appropriation of the sacraments . . . arises from the community’s collective experience of its life in grace.